Are you a gatekeeper? We often think of doorkeepers as a lower position in life don’t we? But it is a position in His court and let me suggest it’s not as lowly as you might think. This weekend, I listened to the testimony of a man in our city, Bill, who had served as the religion editor of our local paper for 18 years. Prior to Bill stepping into this position I submitted numerous stories and press releases that went ignored. The woman in that position at the time was not a Christian, and everything I submitted was turned down. Everything. She printed stories regarding other religions, but anything about Christianity, at least that came from me, seemed to be ignored. Bill had been in a management position with the paper, but when this woman retired, he asked to take her place. The management couldn’t believe he would be willing to take what appeared to be a step down in rank, yet they agreed. Bill became a doorkeeper/gatekeeper. And he changed our city because of it. Stories and press releases that I couldn’t get past the previous editor, Bill now accepted and ran with. For the first time ever in the history of the paper, stories from the religion section that he wrote, hit front page. He wrote fairly and honestly and not just about Christianity, but he opened the door for something in our city that had been shut. He gave voice to the Gospel in our city as the doorkeeper. It puts the position of doorkeeper in a new light doesn’t it? 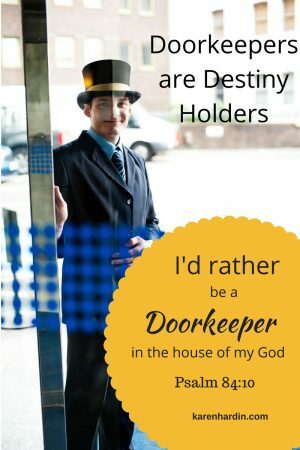 Are you a doorkeeper? Secretaries, receptionists, parents, (and more) are all doorkeepers. They are in a position to protect and weed through information and issues before presenting to those higher up. As a parent, I’m a doorkeeper for my kids. Obviously when our kids are young we can protect much of what hits their radar. As they grow older, we step back in that role in the natural, but step up even more so in prayer. Gatekeepers hold open doors so they don’t shut. I think of a situation with my oldest now. He has just graduated college and is still looking, praying, waiting for what he is to do next. In seasons of waiting, discouragement can set in. I watch as some of the dreams he had in his heart begin to flounder. It is my job, as a parent—a doorkeeper—to continue to press in. I sensed the Lord speak to me about his future and his gift and shared it with him. “Mom that’s impossible,” he explained. I could hear the weariness and discouragement in his voice. He wasn’t able yet on his own to press into it, but as a doorkeeper I could. I know what God spoke to my heart and like Mary, Jesus’ mother, I ponder what the Lord has said and pray over it. I press into his prophetic destiny and call it forth. God can make a way—for like the editor in my city who kept the door open for Christian stories, I keep the door open by my very presence and prayer, for my son’s destiny to be fulfilled. Are you a doorkeeper? Press into the position God has given you and hold the door open.